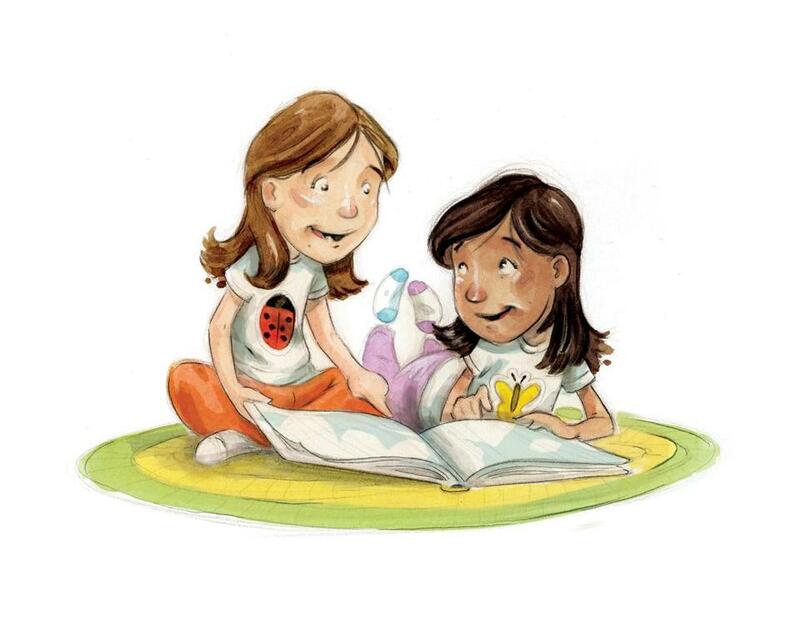 From Mo Willems to Jane Yolen and Norton Juster, some of the biggest names in children’s book call the Pioneer Valley Home. THE LATEST ART EXHIBITION at R. Michelson Galleries on Northampton’s Main Street has a few things to say about the current state of American politics. The images, however, are anything but angry. They’re inhabited by cartoon dogs, smiling bears, and multicolored fish, accompanied by gentle captions, such as “We Are All in the Same Pond.” The art expresses its concerns in terms even a small child could understand. But, then, the creator of these charming political doodles is adept at communicating across generations. Striding into the gallery for a reception in his honor, he’s a bearded and bespectacled character wearing a turtleneck and green Doc Martens boots. His graying, shoulder-length hair is tucked behind his ears and beneath a fiddler cap. Scampering at his heels is his family’s miniature schnauzer, Vincent. The dog looks an awful lot like his master. In this crowd, however, Willems is more a member of the pack than an alpha dog. He’s greeted warmly by Jane Dyer, who has illustrated more than 50 children’s books, and Rebecca Guay, who is best known for her comic-book art and illustrations for the card game Magic: The Gathering. The gallery owner, Richard Michelson, twice poet laureate of Northampton, has also written nearly two dozen books for children. 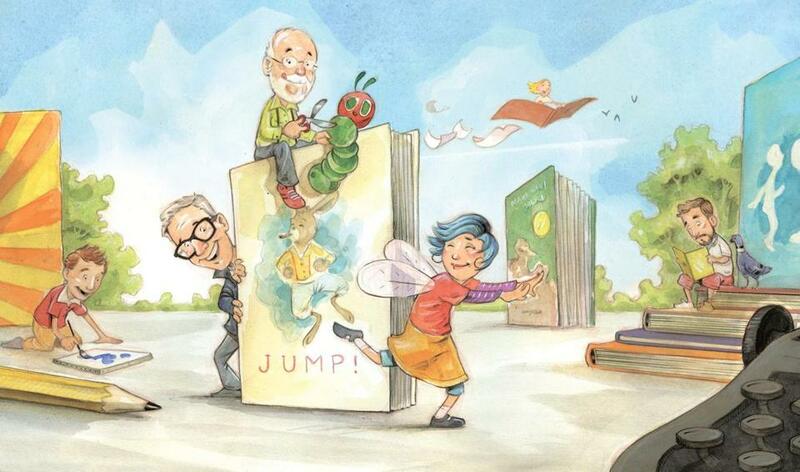 They are all part of what could be a new “golden age” of children’s literature. A few years after the great e-book scare that shook the publishing industry, children’s book sales are growing faster than any other type of printed books. Since the publishing world began assigning imprints to children’s literature in the 1930s, authors with close ties to Massachusetts have played an important role: Theodor Geisel (better known by his pen name, Dr. Seuss), Robert McCloskey (Make Way for Ducklings), and Virginia Lee Burton (Mike Mulligan and His Steam Shovel). The valley region has long been a nerve center of writers, artists, and craftspeople, drawn by the natural setting, the area’s Five College Consortium (UMass Amherst, Smith, Hampshire, Mount Holyoke, Amherst), and its historic embrace of creativity and eccentricity. It’s become a natural retreat for the New York publishing business — close enough for meetings, far enough for privacy. Over the last few decades, a remarkable number of creative types settling in Western Massachusetts have worked on children’s and youth-oriented literature. With the establishment of Michelson’s gallery as a clearinghouse for the art of children’s literature, and especially since the opening of the Eric Carle Museum of Picture Book Art in Amherst in 2002, an influx of authors and illustrators has made Western Massachusetts a gateway to our children’s imagination. “We think, per capita, we have the largest population of children’s writers in the country,” says Jane Yolen, prolific author of 350 books, starting with 1963’s Pirates in Petticoats. Her fable The Emperor and the Kite won a 1968 Caldecott Honor, second only to a Caldecott Medal among children’s picture book prizes (she also wrote the text for John Schoenherr’s 1987 Caldecott Medal winner Owl Moon). Yolen should know a thing or two about this scene: She helped make it happen. She settled in the Pioneer Valley in the mid-1960s with her husband and formed a group for aspiring children’s book authors shortly after her arrival. “I was looking for community,” she says. Later, she started a much smaller group for critiquing. It was sparse at first: Total membership was four, herself included. In 1971, Yolen became the second member of a children’s book writers society founded in Los Angeles. Shortly after, she launched the New England regional chapter, the first for what is now the Society of Children’s Book Writers and Illustrators. In 1973, Yolen planned the society’s first conference, which was held in Northampton. From a small circle of friends, the local scene began to flourish. Yolen realized her adopted home had reached a tipping point for the production of kids’ books in the mid-1980s. By then, Eric Carle, who had moved to the area in 1973, was well on his way to 25 million books sold. And other friends and colleagues — Patricia MacLachlan (Sarah, Plain and Tall, the 1986 Newbery Medal winner), Ann Turner, Julius Lester — were winning awards. They were also breaking new ground, as with Leslea Newman’s Heather Has Two Mommies (1989). “Suddenly, people were coming here,” says Yolen. At 78, she still hosts and attends writers’ groups. And she and her daughter, the children’s book author Heidi E.Y. Stemple (who lives in the house next to her mother’s), run a periodic Picture Book Boot Camp, which draws authors from as far away as Scotland. By the New England chapter’s count, members — there are now more than 1,700 — have published more than 4,500 books for young people. In the front corner of the Michelson gallery, Yolen sits at a round table stacked with prints of Willems’s show poster, sales of which will benefit the American Civil Liberties Union. 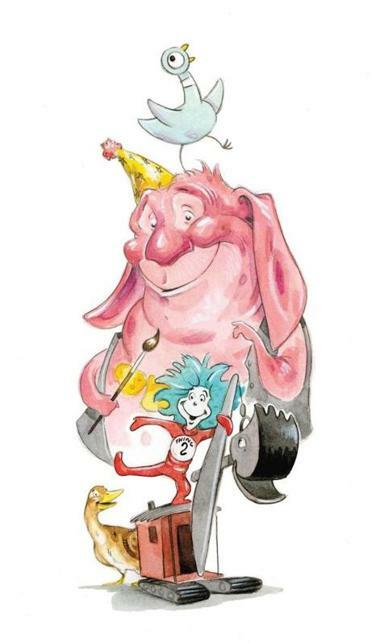 Willems’s picture-book characters — the morose Elephant, the conniving Pigeon — convey ideas that can make some parents uncomfortable, she notes. The world can be confounding; sometimes it will break your heart. RICHARD MICHELSON DIDN’T SET OUT TO BECOME a prime mover in the world of picture book art. Three decades ago, he was showing fine art — paintings and sculpture — in the gallery’s space next door to the bank whose building it now occupies. His prize client was Leonard Baskin, the sculptor, printmaker, woodcut artist, and teacher who created a robust legacy with generations of students at Smith and Hampshire colleges. Another of Michelson’s early clients was Barry Moser, the renowned illustrator and printmaker who lives in a ridge-top home in North Hatfield. One day an unhappy Moser confided to Michelson he’d been asked to contribute drawings to an adaptation of some old folk tales. “I said, ‘What are you gonna do, watercolor bunnies?’ ” Michelson recalls with a laugh. “It turns out it was [Jump!] The Adventures of Brer Rabbit,” the classic trickster tales from the late 19th century. So, yes — he’d be drawing bunnies. Moser soon transitioned from dismay at the prospect of doing a children’s book to genuine admiration for the form. “I’m probably the only illustrator to have the King James Bible and The Three Little Pigs on his desk at the same time,” he told the Globe a few years ago. Work with Moser opened the door for Michelson. His gallery, he claims, was first in the country to showcase children’s book art on equal footing with fine art. When he started, he says, “nobody was interested in children’s illustration at all. It wasn’t a thing.” But he kept at it. In 1990, he launched an annual illustration exhibit that opens every November, and the work began to sell. 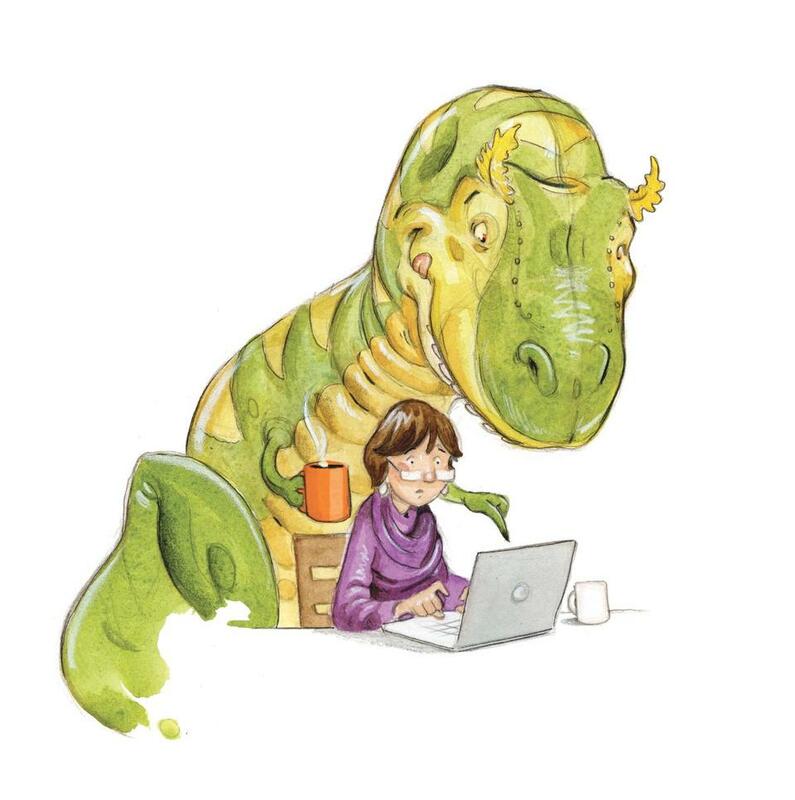 Today, work from children’s illustrators “is pretty much what most people know us for,” he says. Michelson also sells selected work by Eric Carle, who might be the biggest reason for the Pioneer Valley’s picture book explosion. Carle was an art director for a New York advertising agency before debuting his unique visual style in 1967 with Brown Bear, Brown Bear, What Do You See? Then came The Very Hungry Caterpillar, one of the true time-tested phenomena in children’s publishing. With simple, rhythmic wordplay and a distinctive presentation — he made collage figures of colored tissue paper, starkly contrasted against blank backdrops — his books, often printed on heavy cardboard stock, became an essential read for countless children. Carle, 87, now spends most of his time at his homes in Florida and North Carolina. His wife, Barbara, passed away in 2015. In 1999, inspired in part by their visits to see Japan’s innovative institutions devoted to picture book art, the Carles contracted with Norton Juster’s architecture firm to design their 43,000-square-foot museum. They hired Nick Clark as chief curator and director, and Clark (who retired in 2014) was determined to improve the public perception of children’s book art. The growing collection at the Carle wasn’t just kids’ stuff; it was clearly as meaningful to parents and grandparents as to their children. When the museum exhibited work from Charlotte’s Web a few years ago, “you’d literally find people misty-eyed in the middle of the gallery,” says Alix Kennedy, the museum’s current director. As the Carle has established itself, it has developed close relationships with serious institutions such as Atlanta’s High Museum of Art and the New-York Historical Society. Boston’s Museum of Fine Arts is currently featuring a Make Way for Ducklings exhibition organized by the Carle. “It’s a thrilling time for us,” says Kennedy. There are a few other destinations for children’s art around the country. But the Carle, situated in an old apple orchard on land purchased from Hampshire College, has an unrivaled collection, housing more than 11,000 objects, with 7,300 illustrations in its permanent collection. Willems and his family (wife, Cher, and their daughter, Trixie) would agree; they still spend plenty of time in New York. His trips to the museum got him interested enough in the area that their personal trainer and her husband, friends from their old block in Brooklyn, also decided to move, and actually got to Northampton first. IT ISN’T ALL CHILD’S PLAY for people in the children’s book industry. Even with the rise of museum exhibitions and gallery sales, they sometimes fret that their work isn’t taken seriously. Willems’s new political exhibition, “You Are Not Alone: Reflections on the News,” for example, is whimsical but serious. On the Michelson gallery’s level, one wall is devoted to a sample of Rebecca Guay’s recent paintings, not children’s art, but sensual, highly personal watercolors and oils (for this work, she uses the name Rebecca Leveille). The boundaries between perceptions of children’s illustration and fine art may be blurring, she says, but they do still exist. One of Guay’s introductions to the area was through the old Words & Pictures Museum, which operated in the ’90s just down the block from Michelson’s gallery, in a storefront that currently houses a cellphone dealer (the museum is now a virtual one, wordsandpictures.org). Launched by a co-creator of the Teenage Mutant Ninja Turtles, the collection featured work by cartoonists, comic book artists, and graphic novelists. There were four levels. The top floor, Michelson recalls, featured X-rated illustrations. Representing both children’s book illustration and adult-themed fine art has always been a balancing act for Michelson. The space currently features a special exhibit of oil paintings, including a few nudes, by Jon J. Muth, the upstate New Yorker whose picture book Zen Shorts received a 2006 Caldecott Honor. On display in another corner of the mezzanine are examples of the photographic nudes taken by Michelson’s late friend and mentor (and some might say lookalike) Leonard Nimoy, the actor known to Star Trek fans as Mr. Spock. Years ago, before he took over the whole building, Michelson’s old gallery space was connected to the bank lobby by a glass doorway. The bank had one requirement, he recalls: Don’t show any nudes on the wall directly facing our lobby. Relatively speaking, however, the residents of Northampton have been largely unconcerned about the mix of adult themes and children’s art. “We live in the most liberal state, and this is the most liberal area,” Michelson says with a shrug. Willems’s news-themed exhibition is “adult” only inasmuch as the stresses of political partisanship are a grown-up problem. He and his friends and peers share the one trait that’s indispensable to children’s book artists: No matter their age, they can still summon their inner children. MO WILLEMS AND HIS FRIEND Tony DiTerlizzi, coauthor (with another local, Holly Black) of The Spiderwick Chronicles, are co-curating the next show opening at the Carle, in May. It’s called “Collecting Inspiration: Contemporary Illustrators and Their Heroes.” The concept: gathering works of art so influential to their admirers, they had to buy the original (or a print of it). For Willems, that’s a beloved Peanuts strip from the 1950s, which is the first thing you see when you walk into his home. He’s owned it since his first wedding anniversary, when the couple bought it as a mutual gift, spending more for it than they had on any piece of art before that. All these years later, he’ll still stop to marvel at it. In another 40 years, Willems will be turning 9, too.